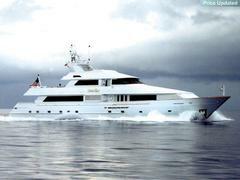 I learn of yet another price reduction as John Cohen at Merle Wood & Associates sees the asking price of his central listing, Broward's 38.1m motor yacht Showtime, cut by $400,000. Delivered in 1989, this megayacht is ABS classed and sleeps eight guests in a master, two doubles and a twin and has a cruising speed of 17 knots. Previously on the market at $4.9 million, Showtime is now asking $4.5 million.